How high can this treehouse go??? Like The Simpsons, it's a true rarity when the sky really is the limit for a series like this kooky, kid-wrangling illustrated fiction set by super team Andy, Terry and Jill. In this latest installment, much has gone on and the Treehouse. New additions include a pet-grooming salon, a birthday room (where a perennial celebration can be had), a cloning machine, a lollipop shop, a balloon orchestra, an invisible level, ant farm and quicksand pit. And we also have a Tree-NN Update at the bottom of each page--alerting us to such serious concerns as a rare pic of Andy and Terry actually working, allergy warning (this page contains nuts) and such gems as 'you have just reached page 28'. I don't know where readers would find themselves without these priceless updates. 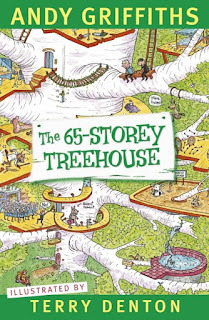 All manner of kooky happenings and upsets occur for Andy and Terry in this latest book, who always manage to dodge dog poop, climb snake ladders and get themselves out of a scrape at the very last minute. As always, kids will delight in the nonsensical outrageousness of each and every crazy conundrum, complete with wildly entertaining imagery that's sure to draw in any reader, from reluctant to rabid. When my 12-year-old boy and 15-year-old girl fight over who gets to read the next Treehouse story first, you know you're onto a winner. 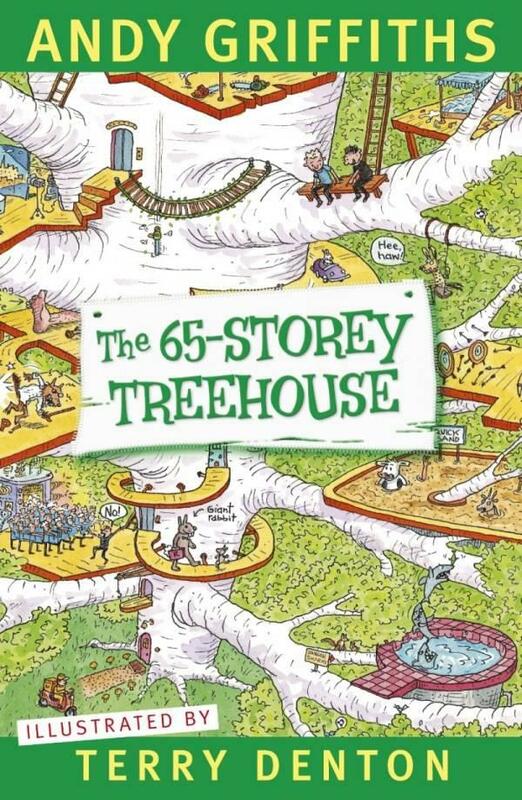 The 65-Storey Treehouse is a fine example of how to have kids fall in love with books. And if kids fall in love with books, literacy is that much firmer in their grasp.